In a time of economical crisis and cuts to art and culture, it’s increasing the number of international examples, cultural subjects, creative professionals (artists, designers, hackers, makers, musicians, filmmakers, graphic designers …) and industries – ICT, science research, manufacturing processes, robotcs, biotechnologies, artificial intelligence and more – involved in the standardization of sustainable development models to the creation of a “cultural object”. Marco Mancuso was contacted again by Anne-Cécile Warms, head editor at MCD Magazine, from 2003 one of the most printed magazine worldwide about digital art and culture, to curate this time a special section (a “Carte Blanche”) within an issue focused on the possible relationships between the world of media art and the one of ICT, applied science, medical, biotechnolgical, mechanical and electronic industries, in terms of new forms of production and dissemination of art objects and cultural products. We’ve got to start living with it, the future is here; those who do not take it in are lost. The twentieth-century sustenance models of artistic and cultural production are disappearing and our generation has not had the time to test them all the way. In Western countries, state subsidies for culture, as well as funds provided by enlightened (and interested) sponsors, are ever more scarce and concentrated in the hands of a few representatives of a social and economic elite that is busy occupying and consolidating its roles and positions. In the last three decades, the necessary finances to activate production processes in the field of Media Art have come first and foremost from institutions, but also from banks, patrons or sponsorships from markets that seemed apparently untouched, though ready to commercially contaminate and thus guarantee survival. The common feeling is that this great welfare mechanism that – let’s admit it – was thought to be everlasting is not sustainable any longer and should allow space to more virtuous art production and dissemination processes. In fact, in a period of growing economic recession and widespread cuts to cultural funding, the number of examples of cultural and creative subjects and industries involved in the standardization of sustainable development models aimed at activating functional productive processes to realize a “cultural object” is increasing: artists, designers, programmers, authors, hackers, makers, musicians, film-makers, graphic designers; but also companies in the ICT sector of course such as hardware and software producers, or active in such fields as scientific research, mechatronics, artificial intelligence, biomedicine or materials investigation. The new “creative classes” come from a varied background; they have not been necessarily institutionalized even though they contribute to creating “value” on a socio-economic model scale that is more connected to the networks and the production of bottom-up culture. They are able to act as a link between the industries and an ecosystem of research centres, laboratories, and academies, exhibit spaces and institutions of excellence, so as to create interesting sharing, exchanging and production mechanisms. The ultimate goal is to activate dissemination and circulation processes for the “cultural object” – a product a company would not have access to – for the growing interest of a whole productive sector ever more ready to invest in arts and culture, more attentively and massively than in the past. 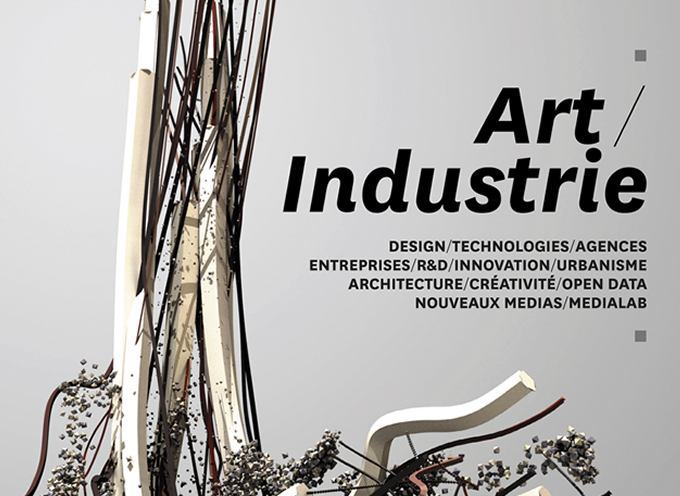 The ability of what we refer to here as “Art Industries” is that of acting as catalysers and incubators of an increasingly popular form of grassroots artistic, economic and cultural production, linked to the usage of (new) technologies; and it is interesting to note how long the list of similar experiences is, both in recent times and with reference to the past century Avant-gardes. If, on one hand, it is useful to recall such programs as the Boston Cyberarts “Artist in Residence at Technology Companies of Massachusetts” (A.R.T.C.O.M.) that puts New Media artists in contact with high-tech companies for a mutually beneficial exchange of technical and creative resources, or the PAIR, The PARC Artist in Residence Program (US), an ongoing research project at Xerox PARC (Palo Alto Research Center), at the ARTLAB, developed by Canon Inc., that serves as a laboratory aimed at pioneering new artistic realms through the integration of science and art by applying digital technologies to artistic investigations, on the other hand it is also important to trace the history of contemporary arts, from the Avant-gardes to the pioneers of the ‘60s and ‘70s – as described in Claudia D’Alonzo’s essay – investigating the thickening of the relationship between art and industry, firstly due to the artists’ fascination for the mechanized world and subsequently thanks to the increasingly systematic interest that hi-tech companies and TV broadcasting companies have had in integrating artists within their R&D departments. The new “Art Industries” highlight the need to operate by activating networks of acquaintances and contacts, integrating artists in the most appropriate productive circuits; designers and creative people belonging to increasingly liquid local/global networks that mirror a hybrid territory, interpenetrated by (in)experience and know-how. We need be acquainted with the most prominent international case studies and draw from specific literature, which is between topics related to “creative industries” and the more “Media Art” oriented publications. Lastly, we must understand how the paradigms of artistic and cultural object creation are changing, how they are being affected by the relationship with the companies and the market and how the mechanisms of expression and freedom of research on the medium are changing. Thus, the interviews and testimonies herein have the ambition to narrate a common experience. From Linz’s Ars Electronica Lab to Dublin’s Science Gallery, from Helsinki’s Aalto Media Lab to Lausanne’s Sinlab, to Berlin’s ART+COM studio and MIT’s SENSEable City Lab, what emerges is a common trait characterized by interpenetrated paths amongst arts, design, science and research on new forms of artistic and cultural production, entailing a tight form of collaboration between the world of industrial production and scientific research. The questions were posed with a spirit of inquiry, to analyse mechanisms and dynamics behind the workability and economics of productive structures referred to globally. The attempt was to extrapolate experiences, highlight strategies, search for often-concealed forms of collaboration; that is, share a possible alternative economic model, as part of a cutting-edge production circuit still overly neglected by institutions, governments and markets. The ultimate aim of this publication is to highlight how the introduction and dissemination of new open technologies, on the one hand, and the development of networks, peer-to-peer structures and social networking dynamics on the other hand, have produced radical transformations in the relationships amongst arts, science, design and society. In fact, if the progressive de-institutionalization of forms of production, management and usage of material and immaterial goods, brought in by new technologies, is reshaping the way we think about the production of culture, economics and information – blurring the boundaries between fields and disciplines, combining methodologies, languages​​, know-how and influencing the distinction between “high” academic approach, and “low” self-taught approach – the birth of a series of platforms and online projects facilitates new ways of relating between producer and market. The Do It Yourself philosophy has become the subject of reflection and research into new and interesting balances for a class of producers of creativity and culture: reduction of costs, lean structures, offer of services, capillary dissemination and communication, platform sharing, sharing of expertise, direct professional relationships are forms and practices that provide the market with culture, art, design and communication in an innovative and competitive way for companies in the sector. This is the sense of Marc Garrett and Caroline Heron’s text: to narrate – with competence, vision and knowledge – about the various experiences carried out at the head of the cultural project Furtherfield and about the series of social events, training sessions and meetings on digital strategy in culture called Art of Digital London (AoDL) / Metamute. I proposed Marc Garrett to tell us about models, potentialities, risks and strategies as regards the difficult relationship between the worlds of art and of industries and private research. How do the conception and production of an art piece change in relation to new industrial and economic paradigms? How can cultural institutions work in such a system and how can curators and producers do their job, i.e. supervise? Whereas, I suggested to Caroline Heron to focus her attention on what roles Media Art and contemporary cultural production are playing and how these are changing(through misuse, adaptation or dependence)within the increasing economy of reputation in the contemporary cultural industry, whilst being affected by Internet and social technologies in a new system of values, social recognition and visibility. How are professional networks (from the world of ICT, computation technologies, science, art, design, manufacturing, hacking, architecture) opening new opportunities to those artists and creative people who are able to relate to different cultural and production playgrounds? Although the two essaysare focused on what is going on in the UK, I think the situation is indicative and can refer, more broadly, to digital cultural production in general. The surprising (or maybe not so much so) conclusion is how thin the divide between art, research and commercial representation of aesthetics, codes and expressive languages has become. Google reigns and prospers over whatever is Internet-related, with a series of platforms and projects aimed at linking companies, professionals, web marketing strategists and programmers, software artists, video artists and broadly intended audio-visually creative people. From Think With Google platform to the Google Creative Lab (that declined to participate in this study), the Mountain View giant clearly looks at contemporary Media Art with great interest. Meanwhile, the number of cultural events is expanding exponentially, in the form of talks or presentations, branded by ICT or computer science firms, in which more or less well-known artists and designers personally represent the industry’s growing interest for their creativity, technical expertise and knowledge of the latest codes and expressive languages. From the Tad Talks, by now covering a broad spectrum of topics, to the Momo Amsterdam conferences, up to the Seed Design Series and to important appointments in the contemporary Media Art circuit such as Barcelona’s Offf, Manchester’s Future Everything and above all Belgrade’s Resonate, the contemporary artist is clearly and mostly a professional who not only is able to respond to the demands of the society he is active in, but also to the markets who reside there. What we may still ignore is how industries and markets look at the world of art and computational design; how research on specific materials and technologies can affect production and sales of artistic works and objects and which is the evolution of the so-called “creative classes” in a world that is radically dominated by technology and networks. In conclusion, it is Nikolaus Hafermaas who tells us that if and how innovation in industry can be driven by creative people, namely artists and designers, and which are the creative processes of conception, experimentation, rapid visualizing / prototyping / testing / fabrication, crowd sourcing, radical collaboration that can be developed on a larger scale and can be potential and interesting for industries to invest in. With this in mind, I would then talk about Open Innovation, i.e. when the processes described herein really affect not only the economical dynamics, but also the production of art and culture in contemporary society. Here innovation is “open” not only because it implies shared knowledge and techniques, but mainly because it activates cross-cultural processes, thus developing artistic objects whose real “value” is not only what determines their impact as “goods”.